Welcome to the Indiana High School Athletic Association 2019 Boys Basketball State Tournament, presented by the Indiana Fever & Indiana Pacers. Athletic Director Chad Gilbert, on behalf of Charlestown High School, welcomes you to the Charlestown High School Sports Arena and the Boys Basketball Class 3A Sectional Round of the State Championship. Charlestown High School is honored to host your next steps in pursuit of a 2019 State Title. 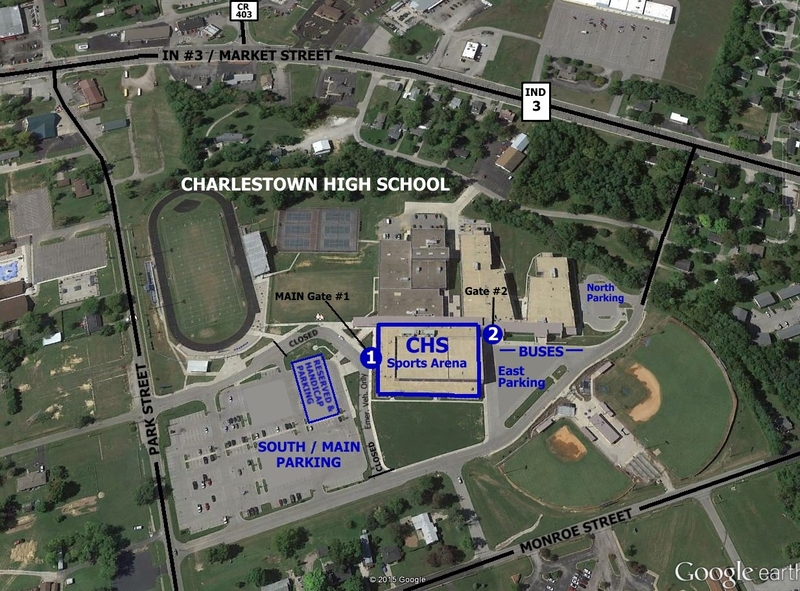 Rest assured that every effort is being made to ensure teams, officials, and fans enjoy a comfortable, care-free, and exciting visit to the CHS Sports Arena and the Charlestown Community. It shall be the responsibility of each high school principal to see that the above restrictions are enforced. *The use of high school pep bands at this IHSAA tourney is permitted. Additionally, please be advised that the entire campus of the Charlestown High School is smoke and tobacco-free; and Indiana State Law forbids the possession of firearms, knives, and other similar weapons on ones person, while on school property. Furthermore, disorderly conduct or the use of vulgar language or gestures shall be grounds for immediate ejection from school property. A single session ticket is good for admission to ONE SESSION (one evening of games). An all session ticket is good for admission to all Sectional Sessions/Games. GATES will open one hour prior to each session tip time. 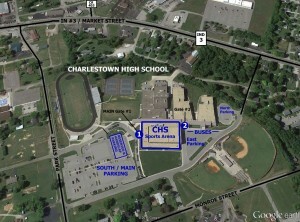 Sectional Team Players, Managers, Coaches and Cheerleaders will be admitted to the Tourney free of charge; and should enter at the Main Gate #1 at the front of the arena, or via Secondary Gate #2 (East Parking Lot) CLICK HERE TO VIEW MAP. There will be absolutely no sign ins, Persons who lose or forget tournament tickets will not be issued duplicates. In order to gain admission, another ticket must be purchased from the available supply. No passouts will be available whatsoever. No exceptions. No seat is reserved, and all fans are asked to sit in the designated fan seating areas or stand along the rails, as long as they do not disrupt other fans egress or game play. Game Floor access is restricted to Regional Team Players, Managers, Coaches, Cheerleaders and Credentialed Tourney Officials and Media. Secondary and over flow parking is available in the East and North Parking lots, located on the northern side of the arena; and adjacent to Gate #2. Vehicles must be properly parked in designated and lined spaces, and in a manner which does not obstruct the movement of other reasonably sized vehicles. Uniformed Charlestown Police Officers will be on hand to direct visitors and provide parking lot security. The Charlestown High School, nor the City of Charlestown are responsible for theft or damage to unattended vehicles on the campus.